At the tail end of what has been a very dry winter, the snow storms, though light, have been coming more frequently. NPS snow plow truck working the road at sunrise. At Mesa Verde National Park, each snowfall of significance is tackled by the park’s Maintenance crew. The snow plows are rolling and scraping before dawn, working the 20-mile road that is the only way in and out. Mancos Valley Overlook, as the snow storm winds down. There is a park “roads hotline” that employees can call (especially those that live outside the park) to listen to a recorded message with the latest conditions and delays, if any. Sometimes they hold us at the entrance station until 8am so that the snow plow drivers have free rein to make several passes outbound and inbound without having to watch out for traffic. Snow covered slopes of soft and highly erosive Mancos Shale. The plows really just push aside any significant snow accumulation. The road remains snow packed and icy because the park doesn’t use salt on the roads. Some sand, but not much. You just have to be prepared with the right kind of vehicle and tires, and be experienced with driving on slippery roads. Or, if you’re a visitor and not an employee, you can wait until the sun comes out and melts the roads off. Since most storms keep right on going, it’s usually not long before the sun gets to do its thing. The afternoons look totally different than the early mornings. Snowy sunrise at Geologic Overlook. Both versions of the day — snowy and melted — are beautiful in their own way at Mesa Verde. In the morning you may have to content yourself with visiting the Chapin Mesa Archaeological Museum and looking down at Spruce Tree House, the best preserved of the major cliff dwellings. At the Museum they show the park movie, have a lot of splendid exhibits, a book store run by the Mesa Verde Museum Association, and of course friendly and well trained National Park Service Rangers. But in the winter season, bring your own coffee and food until the Spruce Tree Terrace Cafe is open for the day, with limited hours. It’s a short stroll from the Museum and the only food facility open in the park in the offseason. Photo location: Mesa Verde National Park, southwest Colorado. The park’s official website is at: https://www.nps.gov/meve/index.htm. Square Tower House cliff dwelling site. A late July afternoon and I got off work at Mesa Verde fairly early: 4:15 pm. Dramatic monsoon thunderstorm clouds had been brewing all afternoon. Time to go home, way down in the valley below. But not directly home. No rush. Not with this kind of light. I chose to make my way back down off of Mesa Verde gradually. Closeup panorama of Square Tower House. The “tower” is the tallest Ancestral Puebloan structure at Mesa Verde. First I drove the Mesa Top Loop. Stopping at the Square Tower House overlook, I photographed the cliff dwelling (it’s my favorite, somehow) as the summertime late afternoon shadows were beginning to creep across the back of the site. The back of the alcove being in shade made for an excellent backdrop. Navajo Canyon on a monsoon season afternoon, Mesa Verde. The bottom of Navajo Canyon, with a fallen boulder as big as a bus. I then walked the short distance to the Navajo Canyon overlook, which is the canyon Square Tower House is perched above. I became interested in the cliffs as usual. But this time I noticed the tan color in the bottom of the canyon. It looked like mud was down there in the stream course (when it runs), but it was grass, done with its short life and gone to seed and dead and dry. It sure did make the canyon bottom’s winding way stand out. Navajo Canyon cliffs, from the rim. My evening sojourn across the “green table” was just beginning. Mesa Verde National Park, the seventh U.S. National Park (1906, while Grand Canyon was still at National Monument status until 1919), is most famous for its incredible cliff dwellings from the Ancestral Puebloan era of about 800 years ago. The park is most famous for Cliff Palace, the largest cliff dwelling in North America. But…the cliff dwellings period at Mesa Verde was very late in the game, before they moved on once again to locations south. Until these people somehow (subject of much controversy among archaeologists, still) decided to make those much more defensible dwellings in precipitous sandstone cliffs, they lived on the mesa tops. Up on the flat. Where they were so much nearer to their crops of corn, beans, and squash. Where they could catch maximum sunlight to warm themselves and their homes year around. So I stopped off the main park road on Chapin Mesa, between park headquarters and the Far View Lodge, to see the mesa top pueblo sites. It was a very easy and pleasant springtime walk. Kiva (ceremonial chamber) at Far View Village, Mesa Verde National Park. This would have had a roof over it in its time. The main site that has been cleaned of rubble and stabilized there is called Far View Village. It is considered a Great House, the center of this long-ago very vibrant community that thrived before the Spanish ever brought the horse and the wheel and metal tools. In fact, the ancestral ones were long gone from here before the Spanish landed in America. They had other places to go. They knew what they were doing. A stone’s throw away from the first one was another pueblo site, called Pipe Shrine House, because archaeologist Dr. Jesse Walter Fewkes found a dozen decorated tobacco pipes onsite in 1922. Archaeology in the U.S. was merely beginning, and Fewkes was to become one of the giants while he probably still struggled to figure out what he should be doing as a scientist in this new field. But back to the ancient ones. I walked on to the next site on the path. And there, not to be outdone by all the masonry work (using only stone tools) of the pueblos was the nearby Far View Reservoir. Reservoir? Like in a dam, an impoundment of water? Yes. Dug out by hand, no beasts of burden yet introduced to the continent. And you thought you’ve put in a hard day’s work. Amazing. The Ancestral Puebloans’ Far View Reservoir, Mesa Verde. After an early evening of contemplating the mysteries of stone building by ancient human hands, I still had to pass by more stonework: that of the planet. So as I once again drove along the northern rim of the mesa, I continued to revel in the springtime light, and the clouds. Gorgeous. Stopping again at the Geologic Overlook. I made several photos to later merge into a panorama. North Rim of Mesa Verde from the Geologic Overlook. Sky and Earth, indeed. Southwest Colorado. No wonder I keep wandering around here. Mesa Verde National Park has the largest ancient cliff dwelling ruins in the Southwest, most notably Cliff Palace, though there are many other impressive ones as well. Cortez, Colorado along the east end of Main Street, with the snowy cliffs of Mesa Verde. The park is located in southwest Colorado, about ten miles east of Cortez, or about 35 miles west of Durango, the two largest towns in the area. Cortez makes for a nice “base camp” if you’re staying in a motel while you explore the area. In fact, the cliffs that form the North Rim of Mesa Verde also provide a dramatic backdrop to the town. If you’re camping in winter, you’re limited to what few commercial campgrounds are open. Although the splendid Visitor Center and Research Center is just off of Highway 160, to get all the way to the south end of the park on Chapin Mesa, where the park headquarters, the museum, and the main cliff dwelling ruins are located, is 21 miles, a drive of 45 minutes. Thus even a quick look at the highlights of the park takes at least a couple hours. And that’s just from the side of the road. In winter, the Wetherill Mesa road is closed, as is the Far View Lodge, and the campground. Also, there are no ranger-led hikes to the main cliff dwellings. The Mancos Valley and the La Plata Mountains, from Mesa Verde. After passing the entrance station, some sharp switchbacks take you up onto Mesa Verde’s north end. The first pull-out is the Mancos Valley Overlook. Here you can view not only the valley, with Highway 160 following it east toward Durango, but the high peaks of the distant La Plata mountain range to the northeast. The next stop is to look the other direction: northwest, at the Montezuma Valley Overlook. Montezuma Valley is where Cortez is located, and being on the North Rim of Mesa Verde you can also look all the way to the Abajo Mountains across the state line at Monticello, Utah. Telephoto shot of the Abajo Mountains in Utah, looking across Cortez and the Montezuma Valley in Colorado. “Mesa Verde” means “green table” in Spanish. But it’s not like a typical mesa, which is typically quite flat. Mesa Verde is more like a table with two of the legs cut short, making it tilt to the south, toward the sunlight. That makes for more frost free days than you would otherwise experience if you were living up there at 8,000-8,500 feet in elevation. Meaning the Ancestral Puebloan people that grew their crops in the fertile soil got enough precipitation (usually) from being up that high, but warm enough for corn to mature before the first frosts of autumn. Some of the canyons and ridges that form the interior of Mesa Verde. So overall Mesa Verde, the landform, is more like several smaller mesas along with a lot of parallel canyons that drain from north to south. 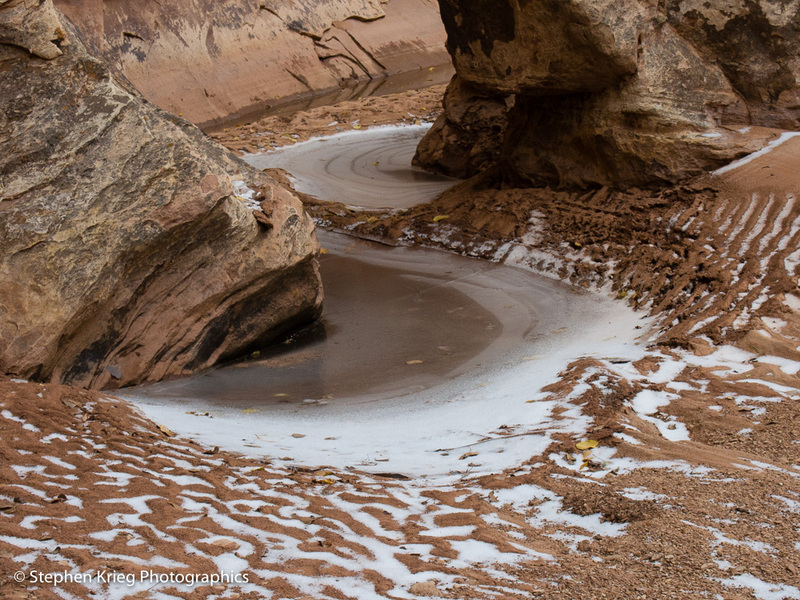 Winter is a great time to take in the many variations in this complex of mesas and canyons. When there is snow on the ground, as soon as the latest storm has passed and the sun comes out again, the hillsides that are facing south start melting off almost right away. The slopes that are facing north, however, hold their snow much later, because in winter the sun is at too low of an angle to touch them. And the ground is too cold to melt snow that’s in the shade. Until spring comes. Even slight changes in direction affect whether the winter sun can warm a slope, or not. Finally, to the south end of the park where the famous cliff dwellings are located. The trail down to Spruce Tree House, near the Archeological Museum, was closed due to a recent rockfall. So it was on to the Mesa Top Loop drive. The ruins of Oak Tree House in its sheltering alcove in the canyon wall. The Cliff Palace Loop is closed in winter, but you can get views of Cliff Palace from across Cliff Canyon on the Mesa Top Loop. From there, overlooks let you get scenic shots of the best ruins. The two-level alcoves of Fire House Ruin. Where was the elevator? The cliff dwelling era was when the Ancestral Puebloans built their adobe, often multi story dwellings and other structures. There are 600 cliff dwellings in the park. 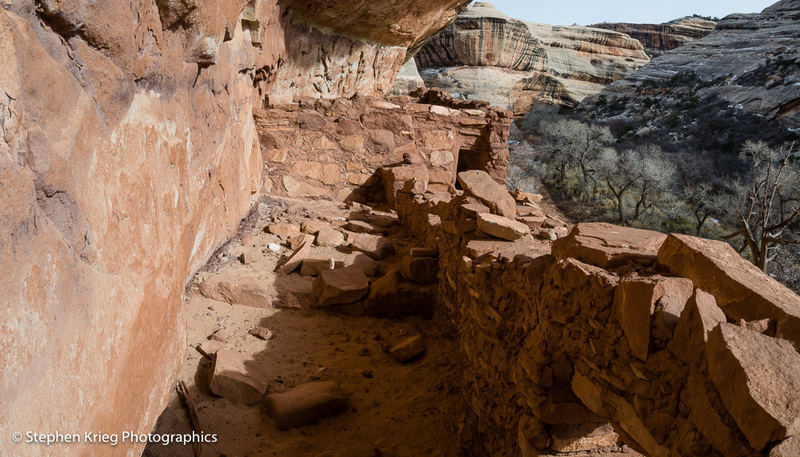 Cliff dwellings were built in alcoves: natural recesses in the sandstone cliffs. Alcoves that face south were preferred. Why? Because in winter they get the most sunlight, while in summer, when the sun is at a much higher angle, the alcoves are in the shade of the overhanging cliff in the heat of the day. They also built pueblos and pit houses on the mesa tops. In fact, there are many more of those than their are cliff dwellings. But the overhanging alcoves provide a lot of protection from the weather to the cliff dwellings, so they are much better preserved over the approximately 750 years since the last of the ancient ones migrated on from here. Cliff Palace, from Camera Point at Sun View. Kachina Natural Bridge on a late January afternoon. It was a fairly drab day, photographically, in one of the least drab locations on Earth: Natural Bridges National Monument. Mostly overcast skies in the dead of winter. But open vistas, clean, crisp air–what more could one want? Though spring was still a long way off, it was coming. It always does (how’s that for a bold prediction?). At this time of year the days are getting longer by two minutes per day. An hour a month! Muddy boot tracks across the ice. Another winter “rove” hike down to Kachina Natural Bridge, in January. Why? Because I’m a park volunteer, and so I get to do such things in the line of duty. To check trail conditions, talk to visitors, answer questions, etc. If anybody’s about, that is. Which, at this time of year, there aren’t many. Sometimes not even any. Like that day. Bighorn sheep petroglyph and ancient hands pictographs on southeast buttress of Kachina Natural Bridge. It was in between the big snows. The gorgeous plastering of the canyon walls and trees just after a snow storm was almost gone, and I was hopeful for the next one soon. Although I love spring as much as anybody, until it gets here I’d rather have snow than drab brown and gray. 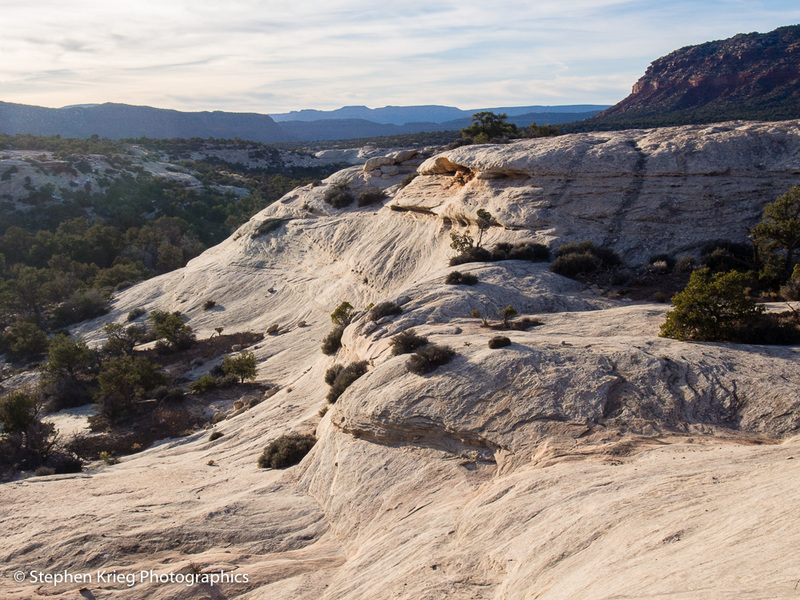 Even in Canyon Country, where the sandstone buttes and cliffs provide an endless source of wonder. They look even more awesome after a snow storm. Kachina Bridge ruin site, White Canyon. The west buttress of Kachina Bridge forms a massive overhanging cliff, a sandy alcove free of snow on a high bank well above the creek bottom. And that alcove must have been a very sacred place to the ancient ones. They were the ancestral puebloans (sometimes called Anasazi) that migrated on to form today’s pueblo communities (Hopi, Zuni, the Rio Grande pueblos) between 700 and 800 years ago. Mud flow patterns, and ancient handprints, on the canyon wall above one of the little adobe ruins at Kachina Bridge. Once again I pondered the small adobe structures. A couple of the conical ones were probably small granaries–grain storage bins for maize (corn), that precious commodity. But the circular, open flat topped one at the bottom of the cliff face mud flows? I think it had a different purpose, quite possibly ceremonial. Especially with the ghost like figures painted on the inside back wall. Ghostly pictographs inside the main adobe ruin at Kachina Bridge. What’s also unique about this site is the presence of butterfly pictographs (paintings). There are several here. It must be some kind of clan or society symbol. They didn’t doodle on these rock faces–each drawing painted, or pecked into the stone (a petroglyph) took time and intent. It’s clear that they revered these places as special, even powerful. Butterfly pictograph, Kachina Bridge Ruin site. Connected spirals petroglyph, Kachina Bridge ruin area. “The promise to spend our lives together” entry in the register, Kachina Bridge ruin. I closed the register box and walked back down from the ruins alcove underneath the bridge again. There in the sand by the little stream trickling by between the frozen pools someone had written: “Faith–Trust–Patience”. The same couple? “Faith, Trust, Patience” in the sand beneath Kachina Bridge. Finally, it was time to head back up to the trailhead. Only 400 vertical feet to go, once again. The lungs and legs were willing, though I can’t say they were excited. Or was that just my mind? Once again I did it, looking forward to doing it many times more before I leave this place. Snow packed stone steps leading out of White and Armstrong Canyons up to the rim. 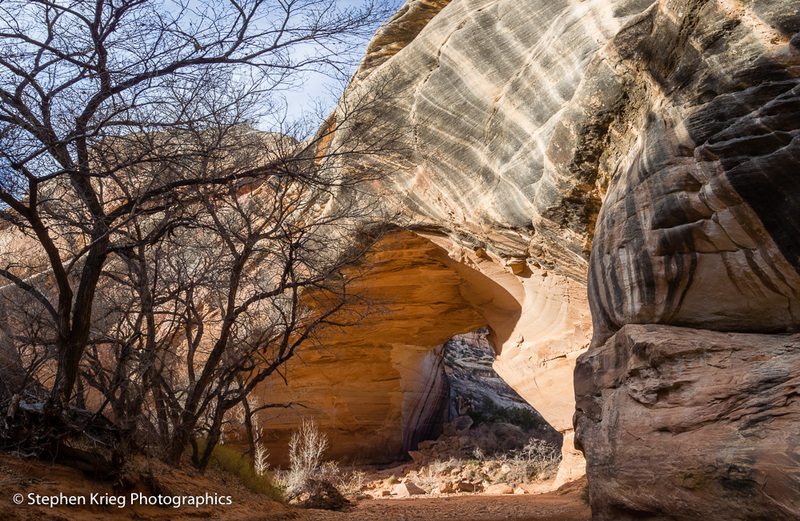 Photo location: Natural Bridges National Monument, San Juan County, southeast Utah. Trail down White Canyon, between Sipapu Bridge and Kachina Bridge. December. Usually one of my favorite months, because the fourth season — winter — is here, and I like the change of seasons. I enjoy the beauty of snow, how it adorns the landscape and shows off shapes. 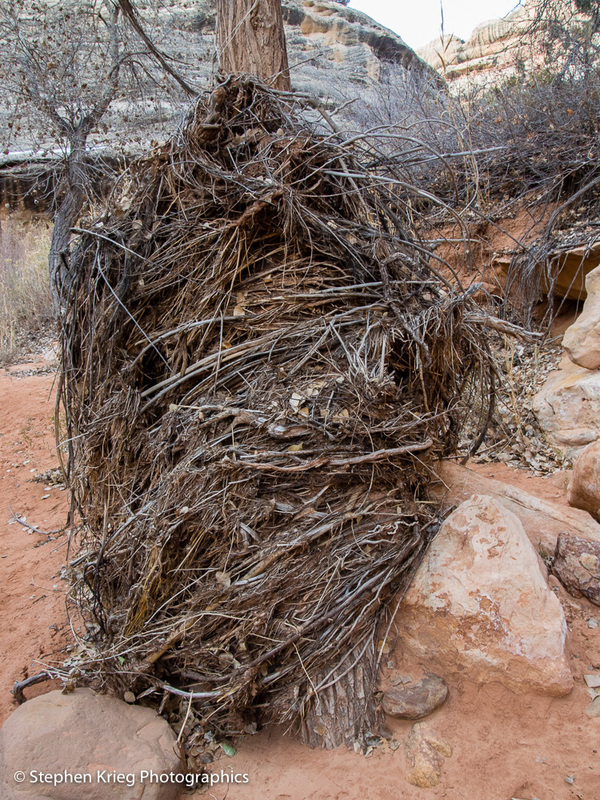 Residue from past flash floods wrapped around a cottonwood tree, White Canyon. Twigs, branches, roots, you name it. This year, though, I’ve felt somewhat of a letdown. Because after a green spring and summer, and a colorful autumn, it suddenly looked so drab to have all the leaves down. It has snowed several times already, but lightly and the beautiful ground cover didn’t last long. I knew what I had to do. I had to get back out there with my camera and see what I could find that was beautiful among the drab. Nature never lets you down. 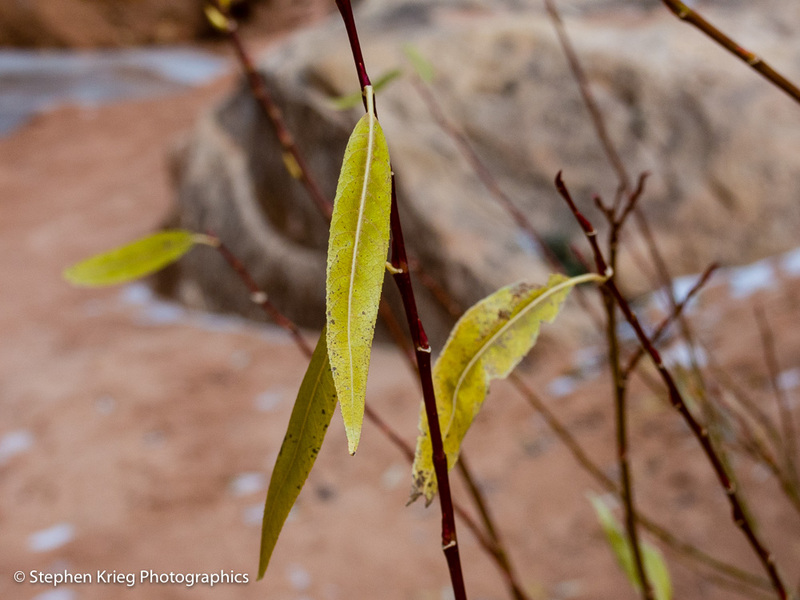 A Coyote willow’s last leaves, White Canyon. So at Natural Bridges I once again hiked down into White Canyon. To Sipapu Bridge and then downstream on the un-maintained trail that follows and repeatedly crosses the stream course. As always it felt good to have the body moving, tasting the fresh outdoors. 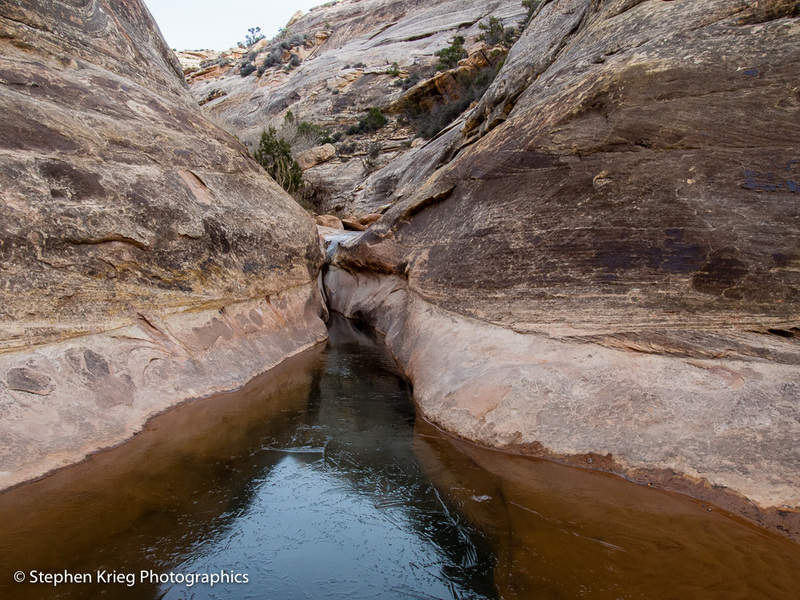 It’s not a maintained trail because to build one that would survive the frequent flash floods would be a massive, expensive undertaking, and greatly scar the canyons. Easier and better to let hikers follow the stream course wherever it’s easiest to walk. I paused to photograph a willow bush along the stream bank, its last leaves hanging on but not for long. “Until the last leaf falls” I keep appreciating them. My attention gets snagged by some bright little circular lights in the ice in a frozen pool. What is that? 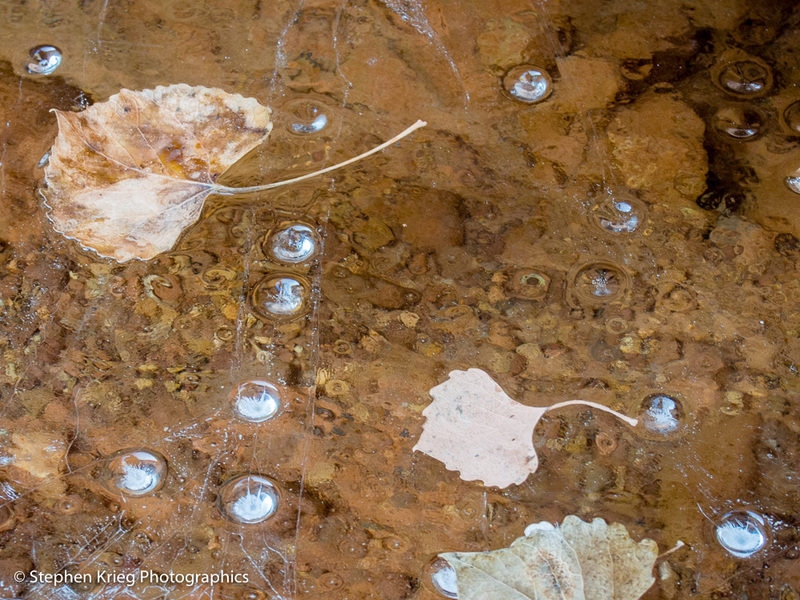 Ice condensation beads and Cottonwood leaves. As I walk closer I can fathom how the dry spell since the last snowfall has had the water level dropping in the stream, while the ice cover remained, the air temps being too cold for it to melt. Then maybe it warmed up a bit to cause evaporation underneath the ice, with the moisture condensing onto the underside of the ice. How cool. 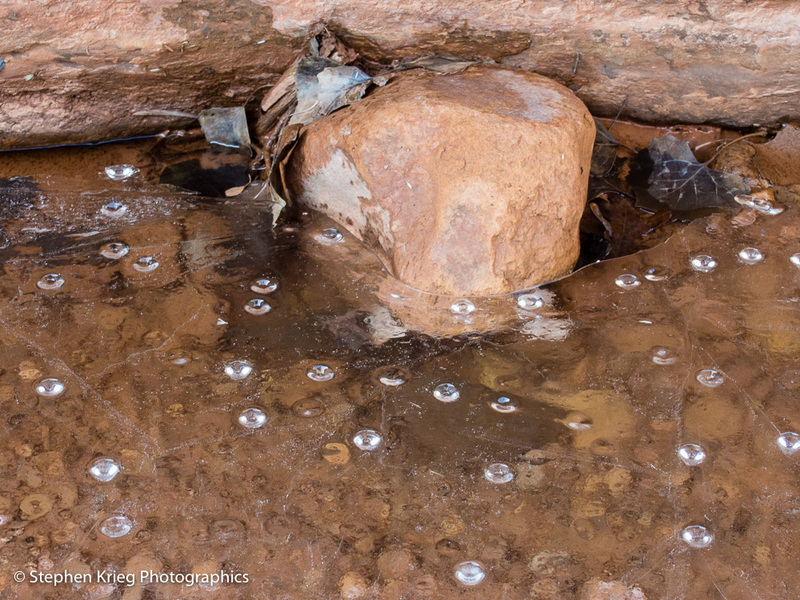 A prime example of the seemingly little treasures I’d hoped to experience on this hike. 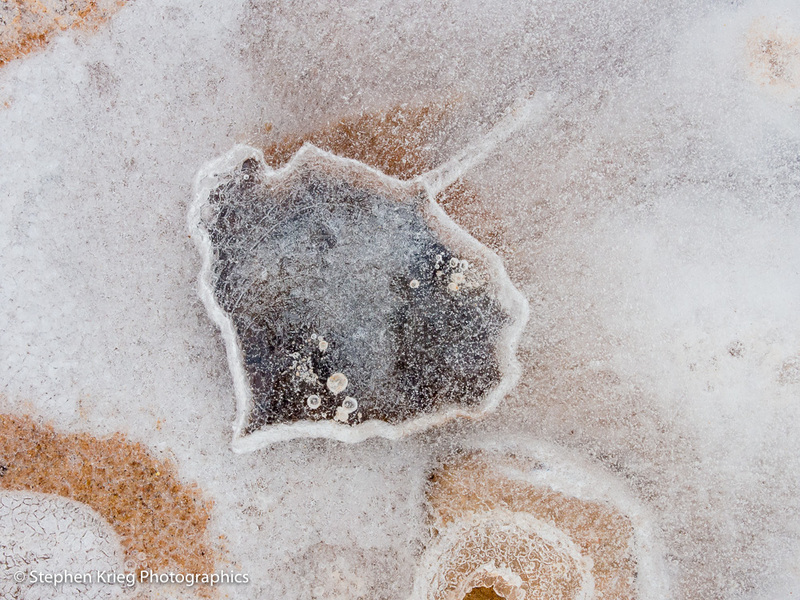 Frozen cottonwood leaf, White Canyon. 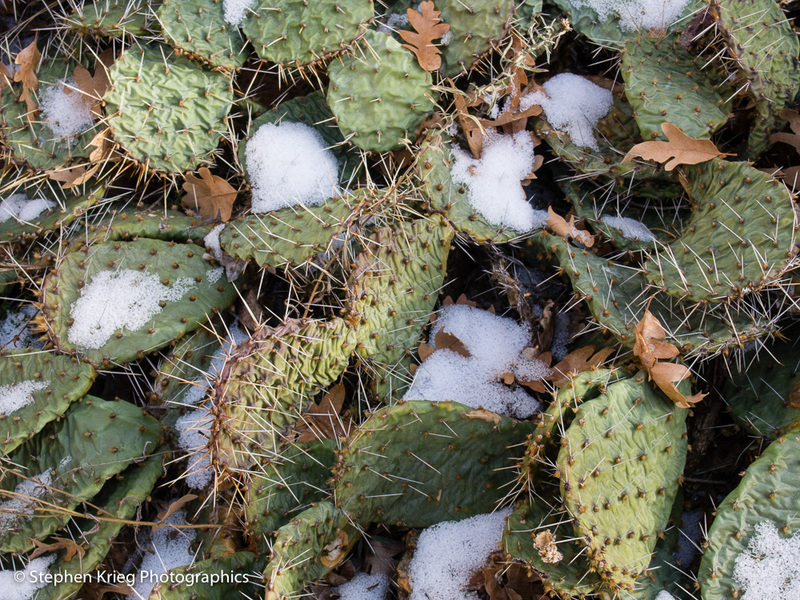 And I am interested in how the prickly pear cacti are doing in this weather. Obviously shriveled up, their tough skin keeping the remaining moisture within bounds. Their green adds a splash of color to the brown streamside bottom. Prickly pear cactus, White Canyon. I come to the mouth of Deer Canyon, a side canyon to White Canyon. The mouth of Deer Canyon, at White Canyon. I decide to walk up Deer. It is very nice going: no brush to push through, just bare slickrock sandstone and some very sandy-gravelly soil, but too unhospitable for plants to take root due to frequent flash floods. Water drainage patterns left behind in sand, Deer Canyon. More frozen pools of water with autumn’s last leaves frozen in them. I find an ancient encampment with a few petroglyphs pecked into the rock face. Which I keep to myself. Continuing up Deer Canyon, it is super easy walking. 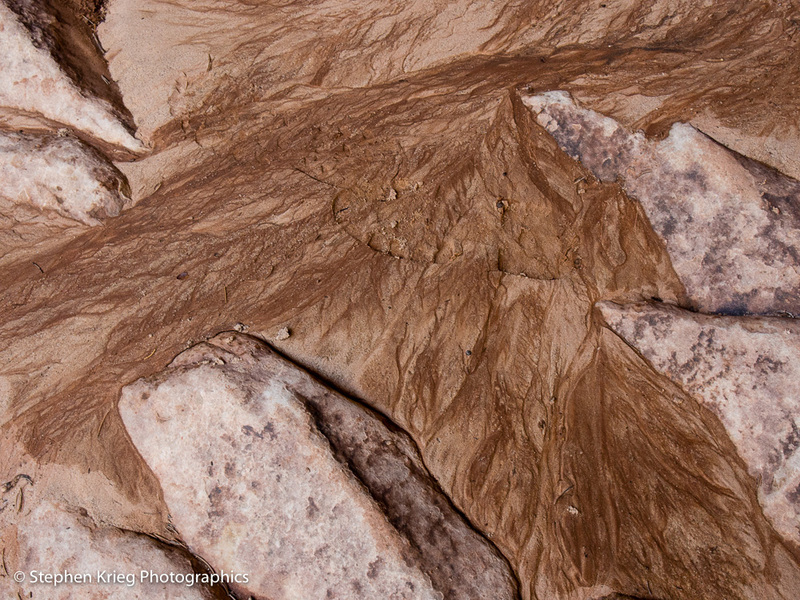 No brush; the canyon floor is almost all slickrock sandstone. The nick point about a mile and a half up Deer Canyon. I finally come to a nick point, a geologic pinch-off point beyond which I can go no further. Unless I want to swim through icy water; it’s that deep. It’s my signal to turn around and enjoy the walk back down to White Canyon, noticing more details in the canyon walls along the way. 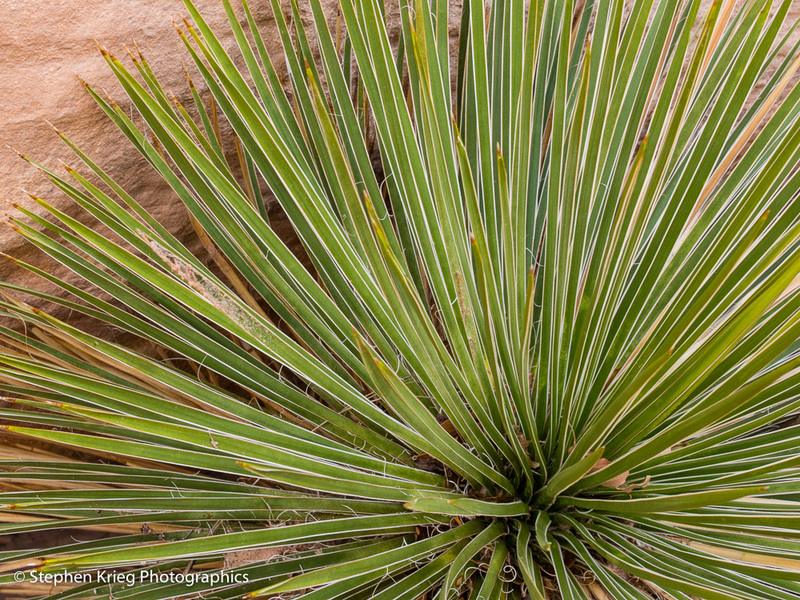 Narrow leaf yucca, Deer Canyon. Then it’s back out the mouth of Deer Canyon, back into White Canyon. Heading west or downstream once more. Horsecollar Ruin north unit, from below in White Canyon. The only part of the site visible from below. And soon to the object of my desire: Horsecollar Ruin. 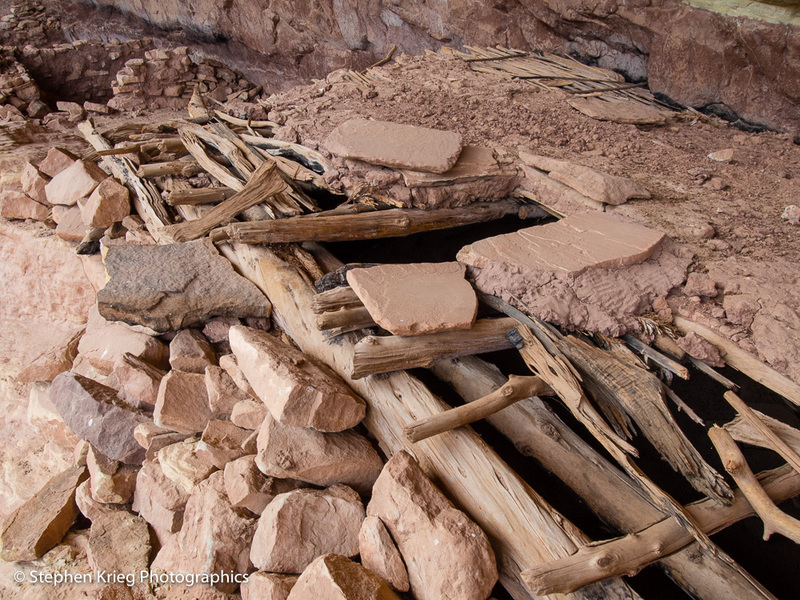 The fascinating remains of an Ancestral Puebloan (Anasazi) cliff dwelling on a ledge above the stream bottom. Horsecollar Ruin north unit, room blocks. I scramble up the steep slickrock sandstone slope to the base of the cliff, then walk along it onto the ledge where the small cliff dwelling remains are. Horsecollar Ruin granary ruins, with their horse collar shaped doors. From below, the only visible part of the site are a few room blocks at the north end of the site. While hiking below on the Loop Trail, if you miss seeing that structure you miss the entire thing. At the Visitor Center they can give you detailed instructions on how to not miss it. I walk through the site once more, trying to notice details I’d missed the other times I’d been there. Structures at Horsecollar Ruin’s south end. 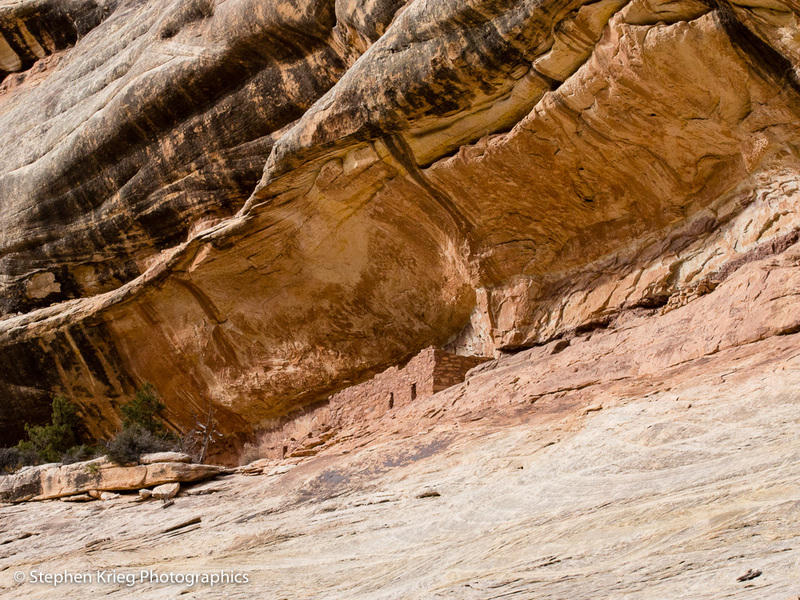 The site features two differently styled kivas, which are semi-subterranean ceremonial chambers. 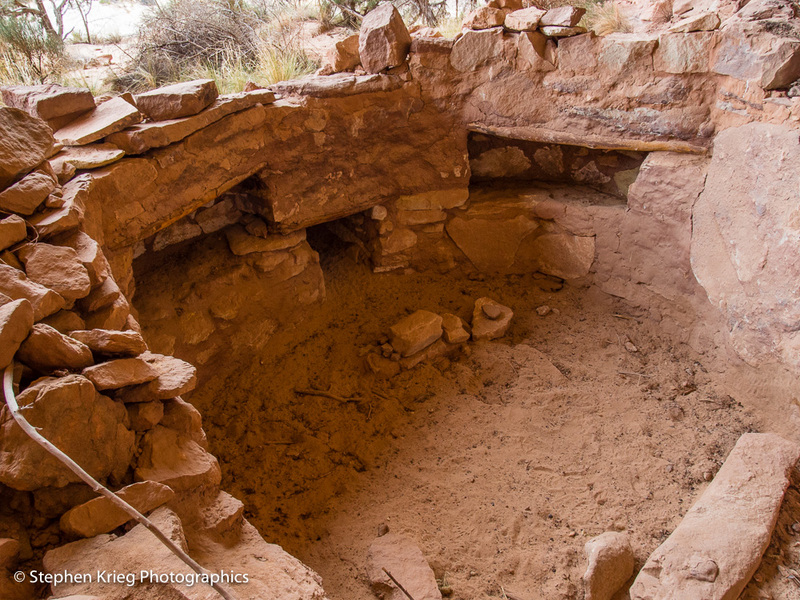 There is a square kiva with most of the original roof intact, which is the style of the Kayenta branch of the Ancient Ones in what is today’s northern Arizona. The square kiva at Horsecollar Ruin. A ladder in the center opening was used to enter the chamber. The other kiva on the site is round, said to be of influence by the Mesa Verde people in what is now southwest Colorado. The round kiva at Horsecollar Ruin. Note small ground level passageway for air to enter when a fire was burning. Finally it was time to descend from the ledge, back down to the trail down the canyon. To Kachina Bridge, the youngest of the three in the park, and so the most massive in terms of its bulk. 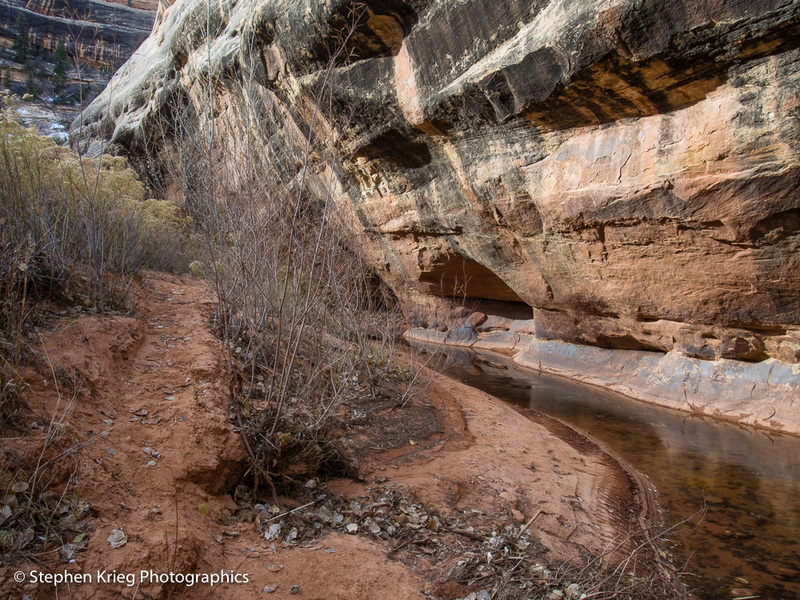 Lots more Cedar Mesa sandstone to be eroded away compared to Sipapu Bridge and Owachomo Bridge. Kachina Natural Bridge, White Canyon at the mouth of Armstrong Canyon. At Kachina Bridge, the North Loop Trail (about 5.5 miles total) leaves White Canyon’s bottom. Up, up for 400 feet of elevation gain in just 0.7 mile. Crossing the Loop Drive road at the Kachina parking lot, it was just two miles across the mesa top to where I’d started. 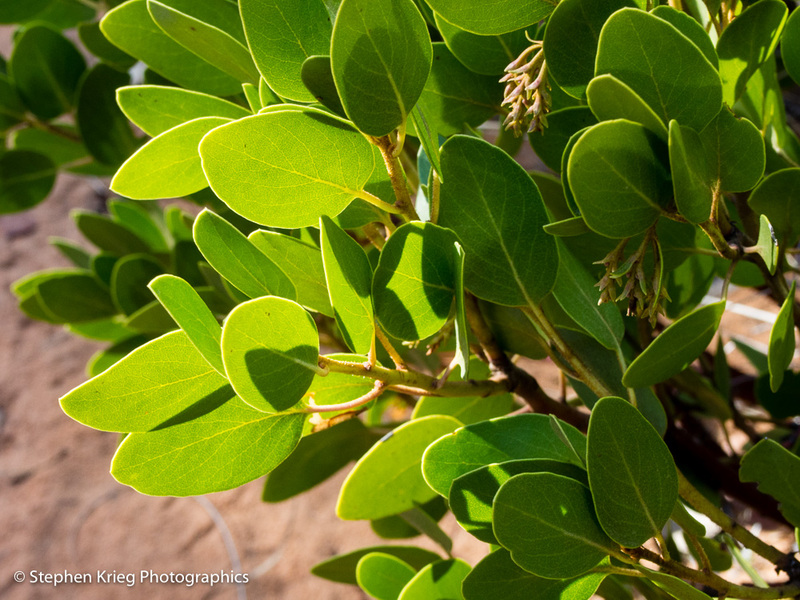 Manzanita shrub in the afternoon sun, its leaves turned to catch the maximum amount of sunlight. A very satisfying early winter hike when there wasn’t much color. I certainly did enjoy seeing details I might not have ordinarily noticed. Cedar Mesa Sandstone on Mesa Top Trail, Natural Bridges.